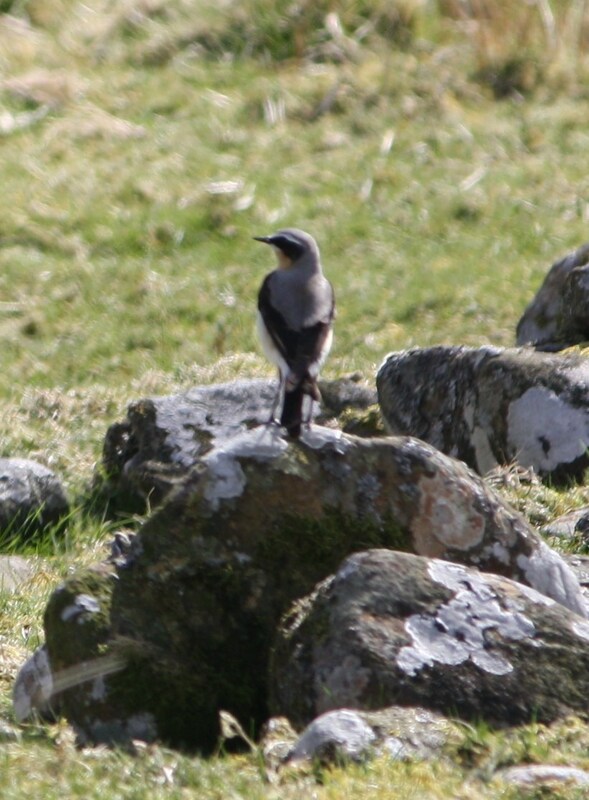 Wheatears are back, and within days, they will be so abundant that I will stop noticing them. Swallows don’t arrive on the Chayne until the end of April, so the best indicator we have of spring is the arrival of wheatears. These pretty little rude boys arrive at the end of March after a long journey from East Africa, and they stay until early in September. I saw the first one of the year this morning as it fluttered infront of the car, and it was a great reminder (as if it was needed) of spring. As I drove up to the Chayne, the local radio station was yammering on about the arrival of summer after the clocks came forward yesterday. Judging by the language the DJ was using, he took off his duffel coat on the stroke of midnight on Saturday and pulled on a pair of Hawaiian shorts. It seems senseless to measure the changing of the seasons by human calendars, as everything happens at different times each year. It’s certainly not “summer” yet in Galloway, and it has been what I would describe as “spring” for the past 10 days. The only thing that has changed is the acronym for our timezone, and the problem I now face with having to get up an hour earlier when I want to go up and watch the leks. It turns out that weasels on the Chayne are slightly larger than the average. I have been trapping more and more weasels over the past few days, culminating last night with three males within half a square mile. One had clambered in to inspect the smell of rotten fish in the mink trap, and the other two had been caught as they dashed across gateways. In order to get an idea of what sort of state the weasels are in up on the Chayne, I started weighing and measuring them to provide an average. Oddly, I have only caught males so far this year, and following some simple maths, I found that they are actually quite large by national standards. With an average weight of 132 grammes, the Chayne weasels were at the top end of the scale, and measuring 10.5 inches from nose to tail meant that they are longer than most. 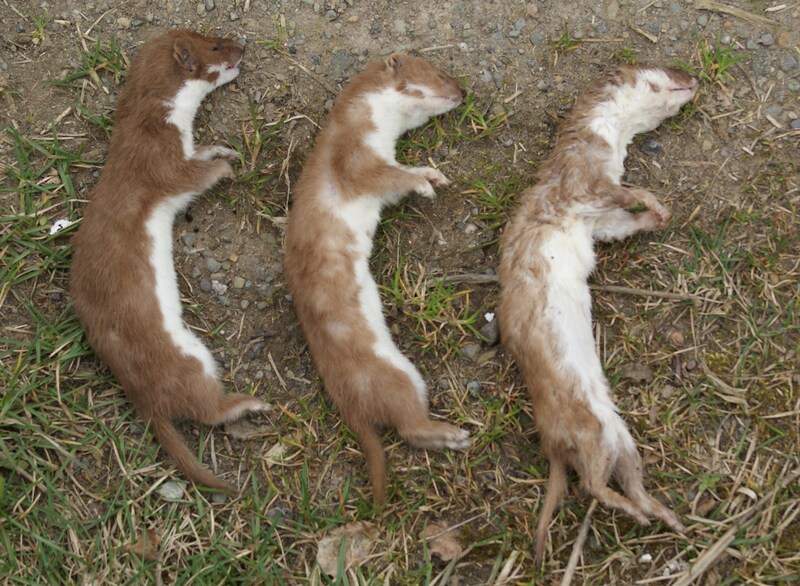 I don’t know what I expected to find when I started weighing and measuring dead weasels, but it’s quite interesting to know that the ones I am catching are on the larger side. As soon as I catch enough stoats to do an average, I will, because judging by the handful I have caught so far, they are far bigger than the national average. Just off for a snooze. 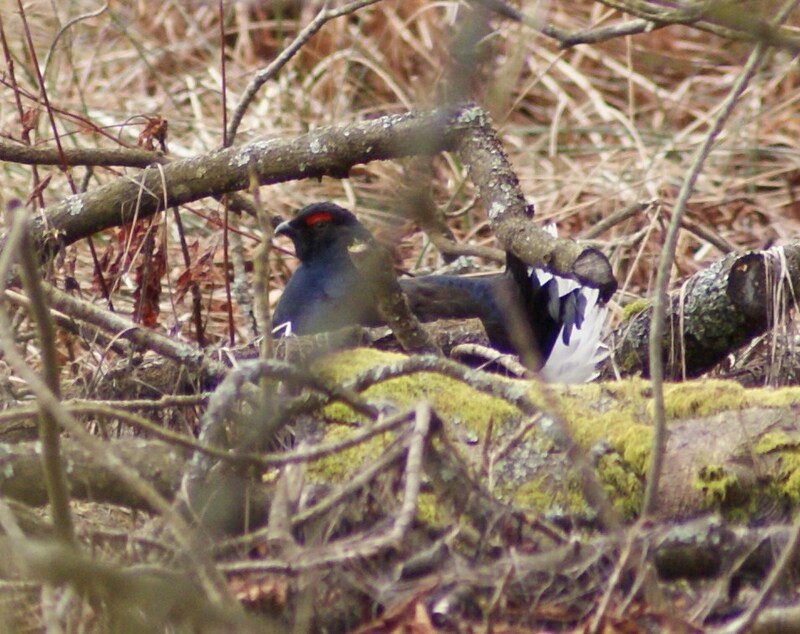 Having been looking into black grouse lekking behaviour over the past two months, I was surprised this morning to watch a blackcock fall fast asleep with his feathers at full lek arrangement. He had been patrolling through some marshy ground, and came to a halt after half an hour. He pulled his head into his shoulders, yawned mightily, then started to blink for longer and longer periods. After opening and closing his eyes for some time, he closed them altogether for three or four minutes. What was surprising was that during his nap, his tail never sagged at all, and his wattles remained at a constant level of inflation. When he opened his eyes again, he looked rather embarrassed, like a commuter who accidentally falls asleep on a train and wakes up with his head on the shoulder of a fellow passenger. He sleeked his feathers down, stretched a wing, then wandered aimlessly off into the undergrowth. Bit by bit, the moor has come to life again. Cotton grass flowers are out, skylarks are larking and meadow pipits are parachuting out of the sky like shuttlecocks. 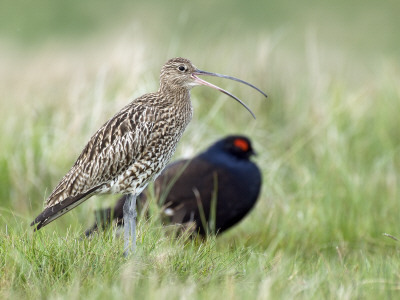 It is a great time of year for the Chayne, made all the more special by the recent arrival of curlews. At the beginning of March I heard my first curlew of the year, and numbers have gradually been building and building. Every open patch of grass now has a jumble of curlews standing proudly on it, and pairs will soon be nesting. By April, I will scarcely be able to hear myself think for the constant bubbling sound of calling birds, and I suppose that I am responsible for keeping their nests and chicks safe from crows and foxes. Having found signs of a raided curlew nest last year, it’s clear that they have got plenty of enemies in the long grass, and I can do alot to make their lives much easier. A tiny larch tree, six weeks old and almost two inches high. It has been a few months since I started to fell trees in the windbreak above the farm buildings with the intention of generating some interesting new undergrowth, and I now have a pleasant reminder of one particularly massive tree felled during that process. The huge larch which had its demise documented in this blog has bridged the generation gap, and its offspring is showing signs of future prosperity. As an idle side project, I gathered some cones from the very top of the massive tree and extracted the seeds in September. They sat in the freezer over the winter, then were planted at the end of January along with some experimental scots pine seeds. 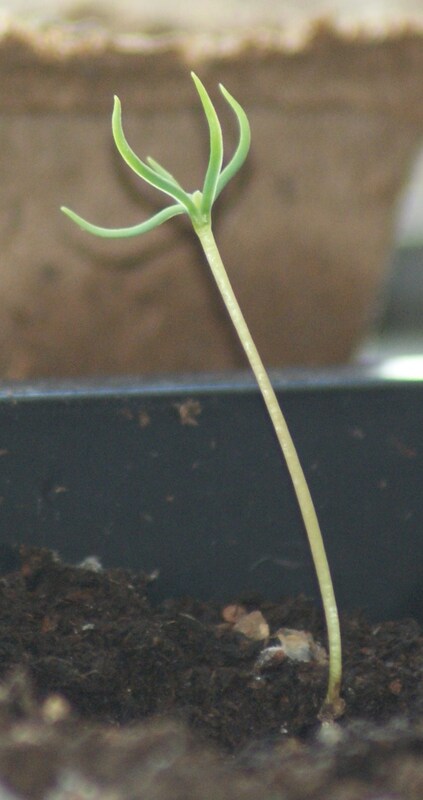 I was totally delighted to find that after a month in the soil, the seeds showed signs of life. The larches leaped up like phoenixes from the ruins of the felled tree, and the scots pines weren’t far behind. In a year or two, they will be large enough to be planted out, and I hope that they will provide the black grouse of the future with something to eat. It says alot about the breadth of moorland management that I can post about trapping mink and growing trees from seed in a single day, and perhaps that explains why I am more enthusiastic than ever about my project on the Chayne. I have always avoided taking things for granted on this project, and while I am delighted to receive help and support from friends, I can’t sign off on anything until I have done it myself to see how it works at first hand. Growing trees from seed is as much a part of that idea as my experiments with cutting heather (soon to be published on this blog) and building bat boxes. As soon as I understand (or get bored) with any one element of this project, the seasons change and I have a whole new list of things to do. The one unifying theme which runs through everything I do is the hope that someday, I just might get to shoot a blackcock on the rustling grassy hills of home! Covering over the trench with a board (left) then camouflaging it and making the trap inaccessible to anything else with sturdy hazel pegs (right). Having spoken to the keeper on some neighbouring ground, I picked up some worrying information about a new enemy. I was told that mink appear here and there on his moor, and given that much of the low ground on the Chayne is criss-crossed with ditches and streams, it seems more than possible that there are one or two of those vicious foreigners doing the rounds on my patch. Having access to a well weathered Mk.6 spring trap, I set it up this afternoon in one of the main burn sides, and I spent some time camouflaging it and making it inpenetrable to anything except a mink. I know that otters pass through the ditches now and again, so extra care had to be taken to make the trap site totally secure and inaccessible to otters. The job would have been easy if I had had a spade, but for some idiotic reason I had left mine at home. As it was, I was forced to burrow an arm’s length into the river bank using only my fingers and a hammer. After half an hour’s work, I had cleared out a satisfactory ditch in the river bank, and I set the Mk. 6 well inside. Taking part of a trout fillet from the “oops” section of Tesco, I broke it into pieces and stuffed half under the trigger plate of the trap and scratched the rest into the far wall of the tunnel. Then I covered the whole thing over with a board and built stones and sods over the top to conceal the whole thing. As an extra precaution against otters, I nailed some sturdy hazel pegs into a cross over the entrance, and set the stones so that they would collapse onto the trap and spring it if anything tried to dig in from above. 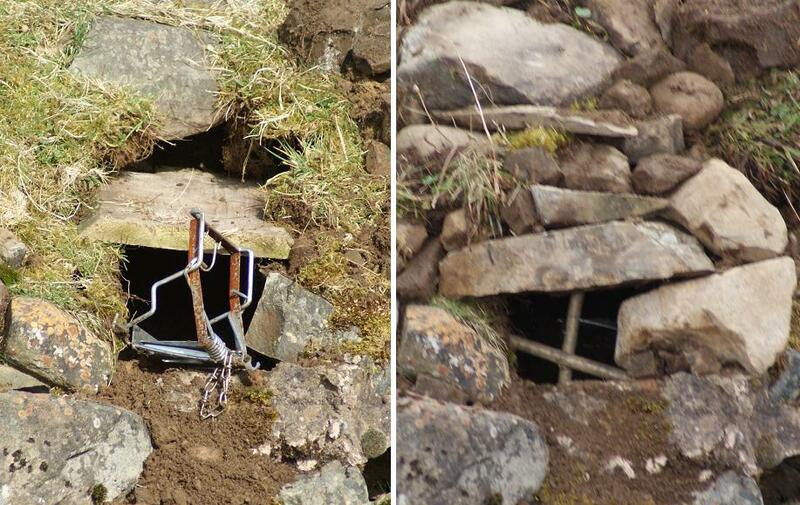 In theory, any passing mink will quickly find the trap and fling themselves into it. If there are none around at the moment, it will do no harm to have it permanently set and checked so that any newcomers will receive a short, sharp shock. County Durham is probably one of the best places in the entire country to see black grouse. 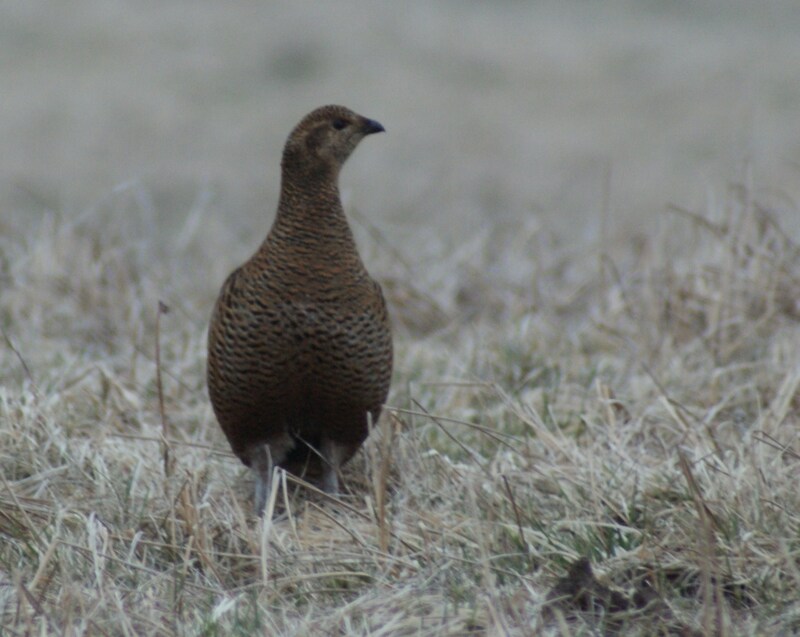 While some estates in the highlands of Scotland may have more birds, the blackcock and greyhens of these wide open English hillsides are so conspicuous that they are reliable enough to travel long distances on a tight budget to see them. Staying in Northumberland last night, I couldn’t miss the chance to see how the leks were going in Weardale and Teesdale, and I set off a 5am this morning on the half hour drive to black grouse nirvana. I had a vague idea of where the main leks where, but thinking it would be more fun to find my own, I began to stop the car and wind down the window every half or quarter mile to have a listen for the familiar bubbling sound. A wind rumbled at the open window, making it hard to hear anything for certain, but snatches of melodious cooing carried through now and again, and I knew I was close. A line of eight feeding greyhens appeared through some blow grass to peer at me, and single blackcock wandered idly around the roadsides, but the fabled “big leks” were proving hard to find. Four or five large packs of greyhens emerged as the morning brightened, and two blackcock lekked together in the inbye field of an abandoned cottage. In an hour, I had seen more than sixty birds, and was having the time of my life. Anyone who has even the faintest reservation about the benefits to conservation brought about by shooting should drive up through Langdon Beck on a March or April morning. Over the course of an hour, I saw red grouse, black grouse, snipe, woodcock, pheasant, grey partridge, red legged partridge, golden plover, hare and roe deer – very nearly every single British game species living within a couple of square miles. As well as sporting birds, ludicrous numbers of lapwings, curlews and oystercatchers spilled over the block-built dykes, and it occurred to me after a little while there had been the constant sound of birdsong since my arrival. Snipe drumming, lapwings screeching and blackcock bubbling made an unrelenting throb of sound which could never be replicated anywhere other than as a result of quality moorland management and sensible gamekeeping.